Enjoy preparing, cooking and serving food with these cute dog pot holders made for the modern kitchen. Who says that you can't have a little sassy fun and be cute (all while protecting your hands) when you're slaving over that hot stove or grill? 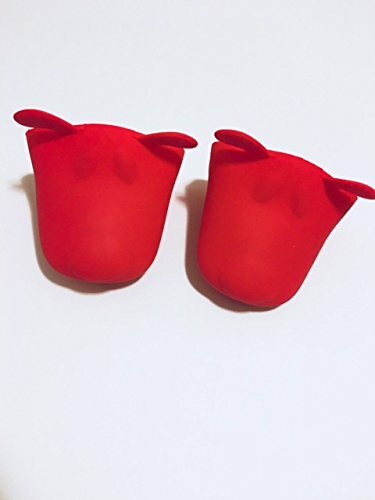 Introducing Inspirfly silicone pot holders designed with an adorable puppy face! These high-density, heat-resistant cooking mitts are tough, durable, and offer a non-slip grip to help you maintain control over your cookware and utensils. Better yet, they're fun and colorful so you can make your kitchen a little cozier without sacrificing essential safety. Click 'Add to Cart' above to get this fun 2-pack of dog-shaped pot holders and make preparing and serving food a little more fun! If you have any questions about this product by Inspirefly, contact us by completing and submitting the form below. If you are looking for a specif part number, please include it with your message.